Archie Bradley was a famous Boxing Champion back in the 1920’s. He was known as the “Gympie Whirlwind” or the “Gympie Tornado”. Archie was born at Wickham Street in Gympie on 4 January 1897. He was the seventh of 10 children born to John and Minnie Bradley. John was born in 1860 in Ulverston, England and (née Gierke, b. 1866, Toowoomba). In September 1917 he had his first professional fight against Joe Healy at the Theatre Royal in Gympie. After 15 rounds the fight was awarded to Healy which was believed to be a controversial decision. Archie went on to win 14 fights in Gympie before travelling to Brisbane in 1918, when he was 21 years old, to further his career. In an eight-month period in Brisbane he had seven wins in seven bouts. He went up against boxers such as “Smiling Georgie” Malouf, Roy Hayward, Bert Secombe and Jimmy Hill. He was even able to knock out the famous Eddie Lynch after nine rounds of fighting. 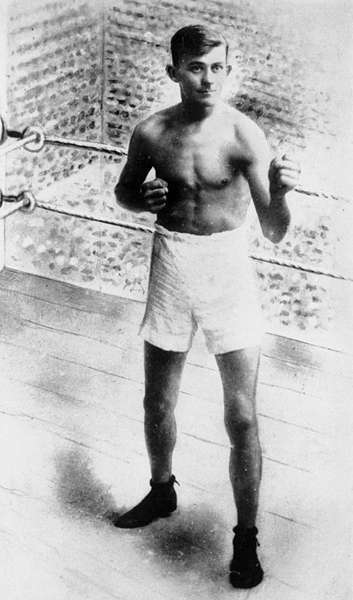 From 1922 – 1924 he was the Australian Welterweight Champion. It was not uncommon for his fans to fill stadiums in Brisbane and Sydney just to watch him fight. In the 1920s his stamina and athletic ability as both a boxer and also as a rugby league player became quite legendary. At the height of his career he had whole pages in magazines and newspapers devoted to him and his boxing. After his retirement from boxing, Archie bred greyhounds for racing. These included “Archie’s Wonder”, “Bradley’s Best”, and “Archie’s Gift”. Archie passed away in March 1969 .